Shot@Life Is celebrating its 1st birthday. as it continues in its goal to immunize children globally and make sure these children also get more birthdays Shot@Life is celebrated during World Immunization Week. Thats this week! Last year after meeting with the folks at Shot@Life i was moved by the cause and i wrote a small piece about it. Not too long ago i was paired up with a Shot@Life Champion to interview. Little did they know i already knew my partner! I got to interview Fadra Nally who used to live in the Raleigh and moved further north last year. being paired up with her gave us the opportunity to talk about a cause we both care about and to catch up with each other. 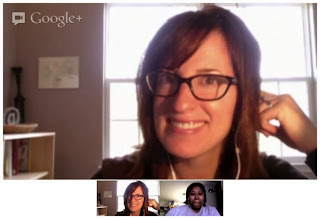 We had a Google + Hangout together and after a while we got down to business. What motivated you to be a Shot@Life Champion? While at TypeA Conference last year Fadra talked to the representatives, went to the talk they presented, and then wrote a blog post to spread their message. When did you become a Champion? Fadra applied sometime in December of last year and then was selected and attended the summit in Washington DC in January. Since becoming a champion what have you done to promote the cause? Fadra writes for the Johnson & Johnson Parents blog. She campaigned and has become a featured contributor on the Shot@Life subject. She pointed out to me that not all Shot@Life champions are bloggers. They range from Doctors, Nurses Director's of nonprofits and others from all backgrounds. Each plays up their individual strengths to promote the cause. This year The Global Mom Relay is donating $5 between now and May 6th for each shared post, via facebook, twitter or email. the money is being donated by Johnson & Johnson and the Bill & Melinda Gates Foundation. Fadra also shared with me that the push to eliminate Polio has come so far and we are down to 3 countries where its still prevalent. The fight continues. I'm very proud of Fadra and so happy about how she's spreading the word of Shot@Life. She's a true champion.